Happy National Mindfulness Day! Mindfulness Day is an emerging annual event, celebrated on September 12, on which day a variety of workshops are held with the intent to raise awareness to the general public about the profound value and benefit of mindfulness. So what is mindfulness? It’s a a technique which focuses on concentrating on the present moment, while calmly accepting the feelings and thoughts that come to you — allowing your body and mind to reconnect. 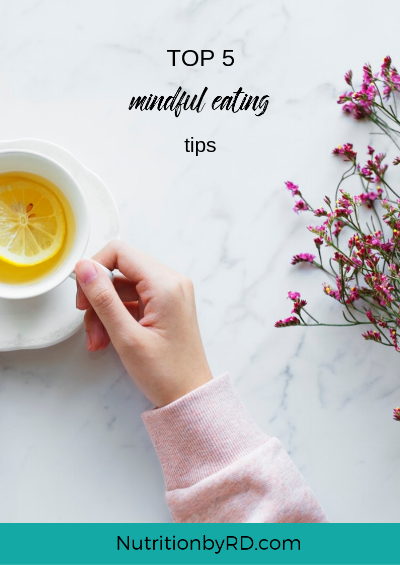 Before I explain what practicing mindfulness means when it comes to eating – I want to share what it is not since many of us have experienced this at one point or another aka: mindless eating. Does sitting in front of the TV eating an entire bag of chips without even realizing where they have all gone sound familiar? Or how about gulping down your coffee and bagel while checking emails at the office first thing the morning? And then barely being able to remember whether you enjoyed it or not? It happens! These are both examples of mindless eating, which can lead to not only lead to overeating, but to experiencing less pleasure and enjoyment from your food too. Below are my top 5 tips on how to practice being more present while eating. Benefits range from weight loss, becoming more in tune to your body and increased enjoyment from food. Make it a point to make each meal it’s own event on your daily schedule. Eating in front of a screen (i.e computer, TV or phone), while on the go or in the car, or any other time when your attention is somewhere else is a sure way to lose track of what and how much you’ve eaten. Scrolling through instagram or facebook (I’m guilty too! but do my best to be mindful of reducing these occasions), watching TV or reading while eating takes your attention away from your meal. Before you sit down, limit distractions so you can truly enjoy the meal in front of you. Chewing your food can be a great way to slow down and really savor the food you are eating. By chewing your food well you can focus on the present moment — the meal. Aim to put your fork down in between bites (i.e if there is food in your mouth then there shouldn’t be food on your fork). if you are eating a meal with a friend, try enjoying the conversation and putting your fork down every once in a while before you resume eating. Each time you begin eating again, you also have a new opportunity to check in with your hunger level as well as your sense of enjoyment. This strategy can help you eat a little less, and enjoy a lot more! *In 2011, Mindfulness Day was designated to be September 12 by Wisdom Publications. Interested in learning more about mindful eating and working with me for 1:1 nutrition and health coaching? Sign up for your free 15-minute phone consultation here!